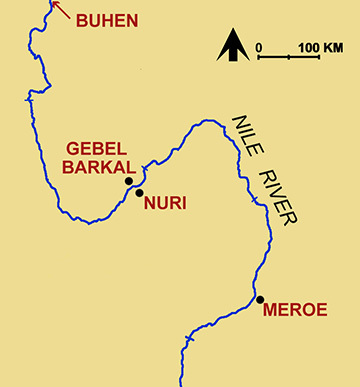 The setting for whatBill Riseman termed "inverse-photogrammetry" was the site of Jebel Barkal, the Sacred Mountain of Kush, located about 400km north of Khartoum, Sudan (ancient Nubia), between the third and fourth cataracts, along the only section of the Nile River that flows south. Jebel Barkal is the current name for the small mountain and its archaeological site marking the ancient city of Napata, founded during the territorial expansion undertaken during the 18th Dynasty. The extensive ruins at Jebel Barkal (encompassing at least thirteen temples and three palaces), first excavated in 1916, were still being quarried by local inhabitants for building materials into the 1990s. Conventionally (up through the 1990s), in photogrammetry, photographs of an existing building are taken, and then the images are scanned into a computer. From the scanned images, computer software can extract dimensions for the building to within an accuracy of a few millimeters. For 'inverse-photogrammetry,' Riseman started with photographs of a site where buildings once stood, then reconstructed the building or buildings upon those remains using 3D modeling software. The process of inverse photogrammetry, as applied to the monuments of Jebel Barkal, proceeded roughtly as follows. In 1989, Timothy Kendall, then assistant curator at the Museum of Fine Arts, Boston, provided Riseman with 3D coordinate data that was shot using a 3D laser transit. With the use of additional paper plans and field diaries, some dating back to 1910, Riseman created simple 2D vector plans whose lines were subsequently extruded up into the third dimension. From that information, he constructed an accurate 3D wireframe model of the entire site. He then digitally composited the 3D wireframe onto site photographs to verify accuracy. The wireframe computer reconstructions of the temples of Jebel Barkal were subsequently rendered into a solid model which was then transposed back onto the scanned photograph for a complete view of, for example, a (simulated) original temple in its original topographic setting (see the image at the left; hover over to enlarge). Later, the scene was enhanced further through the addition of people, trees, and mudbrick buildings to heighten the illusion of seeing an actual 3000-year-old scene. Such visual transpositions and such archaeological insight could not be accomplished through any traditional media with such accuracy, nor with the added benefit of being able quickly and efficiently to test various reconstructed environments for the best archaeological fit. This was our first pass at reconstructions of the buildings at Jebel Barkal. In 1995, a second model was built (focusing on Temple B700), which was subsequently recoded for virtual reality. Work then moved to Temple B300, as LEARNING SITES moved to re-create the entire ancient religious center. Our site model was completely reworked again beginning in 2015 as part of a Unity-based virtual reality research resource.